How to Make a Blog Site - Create Your Own Blog in Just Minutes! Create Your Own Blog Today! Want to know how to make a blog site? You've come to the right place! This quick, easy overview will show you how to create your own blog in just a few minutes - even if you're a beginner and have no experience at all! If you made it to this page you have all the skills you need to make a great blog. The best 'create your own' blog software is called Wordpress. It's the software almost every blog uses to make a blog site. I recommend Act Now Domains for your blog web host. It's who I use for my web stuff. They are cheap, easy, and have great support. Best of all, they have 1-click install of Wordpress which means you just click a button and Wordpress is automatically installed for you. This way they do it for you and you don't have to deal with the usual techie headaches that come with installing Wordpress. There are over 1,200 free blog designs available in the Wordpress Themes Directory. It's the most popular place to get free designs when you create a blog site. If you use Act Now Domains as your web host you can see the Wordpress Directory from inside your blog control panel and their system will automatically install the design you choose directly to your blog. That makes it super easy for you to change your design and you won't have to download and upload the design yourself. This is the fun part. You just add your own content to your blog site which will make your blog unique. You can add text, videos, pictures or anything else. It is very easy to do this part even if you have no experience. 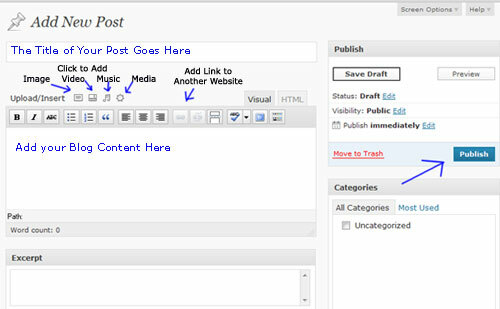 Here is an example screen shot that shows just how easy it is to add a post to your blog. As you see, it has many of the same buttons and sections that you see when you send an email along with a few new ones that enable you to easily add images, videos, music and so forth to your blog. If you want to spice up your blog site you can do it with plug ins. Plug ins are mini-programs that can let you do a lot of cool things on your blog. For example, there is a plug in that will automatically post tweets from your Twitter account to your blog. Another plug in will turn your blog into a social networking site. These are really fun to use when you create a blog site and can really liven up your blog. Best of all, most of them are free. The best place to get blog plugins is the Wordpress Plug Ins Directory. It is totally FREE and provides access to over 13,000 really neat plug ins that you can add to your blog. Just like the design above you can install the plugins directly into your Act Now Domains Wordpress blog with just a click of a button. See how easy it is to create a blog site? It's really easy! In fact, you can create your own blog today in just a few minutes! That does it for the basic overview of how to make a blog site. If you want more information, please visit the Creating a Blog page. I have some videos there and other helpful items. Disclosure: I am affiliated with about 25% of the companies I recommend on this site. This means I receive a commission from some of the companies I mention if you sign up from this website. My credibility is VERY important to me, therefore, I only endorse products I have personally used and truly believe are good. If I don't like them or don't think they are any good I refuse to recommend them. I send my own family and friends to this site for help. Speaking of this site, it is independently owned and the opinions expressed here are my own.